Well it looks like Apple has started banning iPhone hackers from the iTunes App Store. Sherif Hashim, the iPhone developer and hacker who recently found an exploit in the latest iPhone OS 3.1.3, which could enable the unlock on 05.12.01 baseband for iPhone 3GS and 3G devices has been banned by Apple for the so called “security reasons”. 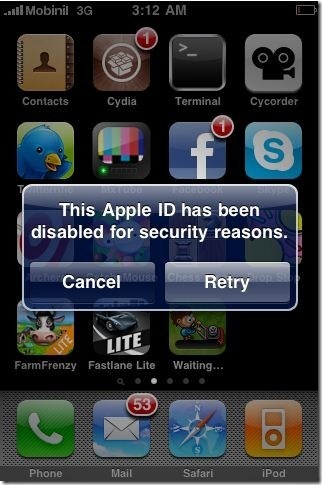 This is what Sherif gets when he tries to access App Store from his iPhone. Another iPhone hacker named iH8sn0w who is behind Sn0wbreeze – the PwnageTool alternative for Windows also confirmed this action from Apple saying that his Apple ID was banned following the release of XEMN. It is to be noted here that the said exploit which Sherif found has not been released yet. The iPhone Dev-Team who tested out the exploit confirmed it as working but they didn’t gave any ETA on when or if they are going to release a tool which is going to unlock iPhone 3.1.3 05.12.01 Baseband for iPhone 3G and 3GS. Maybe they don’t want to waste this all important exploit for this minor update and instead will use it when the major update such as iPhone 3.2 or iPhone 4.0 is released with the next-gen iPhone 4G. LOL Apple will get owned. Banning THESE folks will prove to be Apples biggest mistake. Steve Jobs is Hitler. I truly hate him. It amazes me that Apple makes so much money when they constantly treat their customers with arrogance and contempt. I have a Nexus One phone now. I got rid of my iPhone because I was tired of being shackled to iTunes, and having Steve Jobs decide what I can do with my phone. So, the story comes, and people (example “Jon Wren: Dev-Team please release it, I can’t use my iPhone”) will still take it because they have this “apple is everything” mentality. The Simpson’s with their spoof of Apple products didn’t go far enough into the totalitarianism that is “apple” today. Microsoft is barely any better and in some cases worse, but people make apple out to be the good guys.. not so. yes I think if Apple continues this Hitler approach, I am going to move away from their product or I’ll only purchase them when I know they are hackable 🙂 but nah seriously, I think I’ll just wait another 1 or 2 years till another company catches up. if i understend it is not posible to jaibreak iphone 3gs 31.3 new bootrom?? For your protection, your Apple ID is automatically disabled (partially) if your account password is incorrectly entered numerous times. This affects some services you may access with your Apple ID, such as your accounts with: Apple Photo Services, iTunes Store, and MobileMe. Apple will finally understand what Microsoft goes through daily. This is just more fuel to the fire for apply hackers. disabled for security reasons means you entered your password wrong 3 time and you need to reset you password now .. The apple has gone rotten!!! WTF apple is thinking?Afterall , if the Era of Jailbreaking is over , then the Iphone ERA will be over. Especially with the Androids that are growing so fast..<br Apple , they got in the center of the hurricane now…Everyone is fighting for a market share and Apple uses wrong moves.. The app store is for iPhone users. I think once you Jailbreak an iPhone it is no longer an iPhone. yeah, we really need help for unlock 3.1.3 baseband 05.12.01 first.. after that, hopefully I dont wanna upgrade the firmware anymore.. coz apple will be making harder if they give a new firmware.. please.. really need it.. thank you very much..
simonsays: No Its not an iPhone it's a BETTER iPhone! Yea because Apple is too busy combing through the confiscated computer servers at Gizmodo. Ya know buying an iPhone from a guy that found it in a bar is evidently the crime of the century!! if it's a lot of work for them for nothing, then they should stop doing it in the first place, don't you think? 😀 by the way, i don't need any of these nonsense. F*ck iPhones! F*ck Apple! “iFunia blog” will show you how to Jailbreak iPhone 3GS in 3 simple steps.